Lately I'm addicting to these episodes of "A Haunting" on Discovery Channel and today I had a thought about how this relates to abundance and manifestation. In almost every haunting case, which are true stories by the way, a paranormal investigator is contacted. In each case, the investigator describes how negative emotions only make the entities stronger, giving them power to cause harm. The more fear and anger the haunted feel, the scarier things get. The negativity actually FEEDS the negativity, making it even stronger and more dangerous. This is true in everyday life. Think about how a defensive reaction creates more trouble in a conversation or relationship. Think about how the start of a bad day can make the whole day bad if you let it get you down. What about the times when you used the term “when it rains, it pours”? In one of these episodes of "A Haunting", a clairvoyant comes into a Salt Lake City home and clears the strongest, scariest entity with a fearless command to leave. She faces it head on, with calm strength, until it shrinks away, freeing all the other entities it had held captive there. Where in your own life can you face your fears with calm strength? What you fear, you feed. 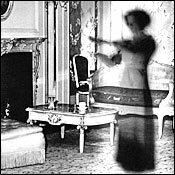 The episodes from "A Haunting" can teach you how negative entities are nothing more than negative energy and both can be neutralized. You create what you fear by focusing on it. It’s actually a good example of how you manifest exactly what you think about. When in your life has what you feared come to pass? Turn fear into trust. Develop a relationship with your higher self, spirit guides, and any higher power you believe in. ASK them for what you want and need. Learn to ask for everything you want and trust that you will get it. There is no fear or anxiety in trust. Instead of thinking about the things you fear, decide what outcome you do want in your situation and keep imagining it happening until it does. Sometimes our fear is buried deep down in our unconscious. When I’m not getting the things I want, I keep asking myself, “if I got this, what would be the downside of having it”? Once you realize what you fear, you can clear the fear with EFT. To be really effective, first create in your mind the outcome you desire. I like to form setups with an affirmation. For example: “Even though I’m afraid that if I lose weight, all of my friends will abandon me, I deeply and completely love and accept myself and choose to be an inspiration to my friends instead of an envy”. Then I tap on “this fear”, “clearing this fear of losing my friends”, etc. Sometimes it takes some deep work to determine what blocks you from abundance. If you need help reaching those deeper issues, please contact me. Helping to facilitate transformation by accessing the state of possibilities.